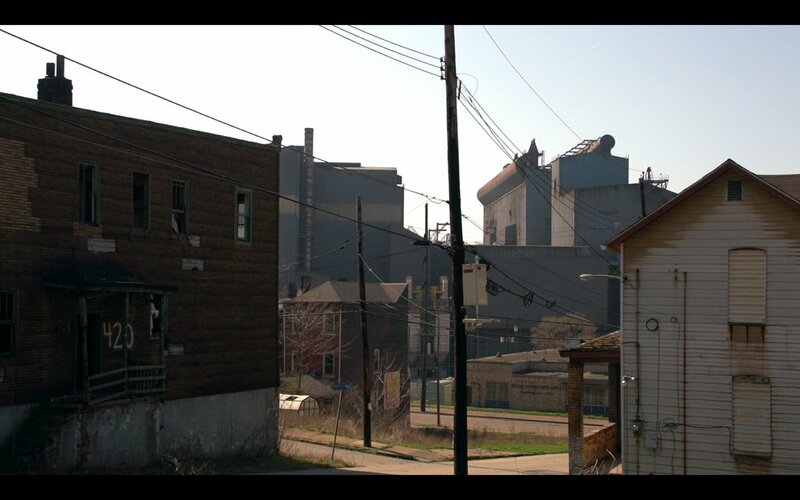 “Braddock, America” is a feature length documentary now in limited release set in Braddock, Pennsylvania, a former steel town now left to literally rust away to hell. Like so, so many other towns in Pennsylvania, Ohio, West Virginia and throughout the Midwest, Braddock began life in the 19th century as just a place along a mighty river, surrounded by coal. Then Andrew Carnegie built a state-of-the-art steel mill. George Westinghouse followed suit and constructed his first plant in a valley adjacent to the Monongahela River. For the decades that followed, the Monongahela valley was the industrial pulse of a growing America. Most of the steel that made the United States the world’s leading industrial nation, steel for train tracks, cars, the girders of the then world’s tallest skyscrapers, was made in places like Braddock. Workers were granted some share of the profits, protected by the strong unions they had fought for. There was once a rough kind of social contract: work hard for the mill, and in return you’d make enough to raise a family, have health care, retire on a decent pension. The system was not perfect, but it fueled the greatest economic boom and consumer society known. Then, during the late 1970s and into the 1980s, everything changed. Steel was imported, manufacturing across the U.S. declined, and the unions were broken. Soon enough, the mills went away, leaving the people. The Rust Belt lost a manufacturing empire but never found a new role. Braddock is a place that capitalism discarded, a victim of America’s apartheid of dollars. “Braddock, America” is a well-made documentary that weaves together the past (the film begins with archive footage of the glory days), the present, and pokes at an uncertain future that haunts the whole town. There is no narrator or off-screen voice; the people left in Braddock (90 percent of the population has escaped over the years since the mills shut down) tell their stories alongside images of the near-ghost town in which they live. It is a gentle, touching portrait of good people trying to pick up the pieces, after their livelihoods were taken away by larger processes they do not even now fully understand. They display a sad stubbornness, and you watch the film both admiring them and wanting to shout at them to get out. One scene shows a city official walking down a deserted street designating empty homes for demolition. Another one shows kids playing in a deserted school building. The town can no longer support a grocery store. A worker looks back at the mill, and calls what he and his father did there “sacramentel.” Town officials discuss their hope that additional money will come from the state to help them demolish more derelict buildings. An outside job/career coach’s presentation falls apart when none of the people in the room have any previous work experience to cite; one asks if his labor in prison counts. Abandoned homes can be bought for $3000, unless they have already been stripped by thieves of their aluminum siding and copper wiring, in which case they are worthless. The image above, from the film, tells the rest of the story. The film suffers from a few things. Persons being interviewed are not identified, leading to some confusion. The historical clips are used in many places as filler, and disrupt the flow of the film. The film lacks a clear narrative arc; people talk– and they are interesting– and then the film ends. A touching scene in a bar where local musicians play the song “American Pie” is cut short. One key historical event discussed, a violent labor strike, appears to have taken place in nearby Homestead and not in Braddock. The people of Braddock still express hope, or perhaps are left only with hope, as the only strategy for a way out. But like nearly every town in the Rust Belt that has tried to dig itself out, the optimism often seems misplaced and misguided over time. “Things got broken here,” says a two-year old ad for Levi’s also filmed in the town, “maybe on purpose, so we could get to work.” That did not happen. A New York Times video features Braddock’s then-mayor explaining how the town will “rise from the ashes.” He said that in 2009, and it did not happen. By the time this film was shot in 2012, that mayor was already gone himself. The filmmakers have created a sensitive memoir to a place and time that once described America to the world, and, with some irony, now, ironically, again describes America to the world. You can see trailer for “Braddock, America” online. When does the Blockbuster Hollywood movie “Hope, Change, Believe-Part Two” come out? A Tuesday in November? Towns such as Braddock are not aberrations unfortunately. One could travel through parts of the breadbasket of America and see towns which used to have a general store, library, a school, maybe even a baseball field with a town team and now see a place where 100 people at most live (mainly the elderly) down from three thousand as late as the 1970s. 500 acre family farms have disappeared after big ag bought the small farms out. Things are pretty grim in those former farming “communities”. The center coast might be where most of us have to flee to in ten years but damn it will be real homesteading not vacationing. Ten years? Flee? “The center coast”? Which center coast? Really..I want to know. The Eastern seacoast of Murka or the center coast of the Pacific side? Perhaps British Columbia..or Mexico..east or West” Maybe you meant ..Brazil..or the Mediterranean,, or maybe Africa..hmmmm?. It’s supposed to be a joke about the MidWest being a third coast. It is where the intelligentsia from either coast will have to seek refuge and after 100 years will be the new New York or San Francisco- all artsy and hip. Oh. I never heard it. Ok. Sorry. Thanks for clarifying John. unfuckingbelievable. The Framers would be in groups making up hangman’s nooses..
Of course..the DFCOTP does’t have a clue how to make a hangman’s noose. Or use it. bartender..one bottle of TWO KNOTS and a double shot of 100prf NearestLampPost..
bartender..give me your best.. 100prf RALPH STANLY..
That is all so sad. Whenever I talk about Tom Joad, people always come up and tell me about their hometown, or someplace nearby, that is economically devastated. The saddest part is we won’t see a single presidential candidate show up in any of those places. The towns are too sad to even use as background props.